Professor M.S. Rao, Ph.D, International Leadership Guru and Father of "Soft Leadership"
People encounter several challenges globally due to various reasons such as volatility, uncertainty, complexity and ambiguity. Currently they encounter challenges much bigger than their predecessors due to rapid growth in technology. They enjoy more comforts than their predecessors but suffer from ailments arising from stress and burnout. Hence, the importance of spiritualism is felt more than ever before. In this article, we will discuss spiritualism that helps you lead your personal, professional and social life happily. Spiritualism is more about invisible than visible. It is more about mind and human spirit than the so-called materialistic things. It is not connected with any religion. Spiritualism is a way of life anyone can practice achieving harmony, peace and love in life. Spiritualism is a means to achieve your end of salvation. Spiritualism synchronizes your mind and body with soul. Spiritualism is to surrender yourself to serve others. It is to refine your thought process to build a positive attitude and develop an attitude of gratitude. It is to keep people around you happy and warm with your positive thoughts and vibrations. It is to build better communities and societies. It is to build a better world. Above all, it is to leave a better legacy to your next generations. It is observed that the people who are divorced, bankrupt and encounter death in their family become more spiritualistic. They find solace in spiritualism since they forget their unpleasant events and failures. There are innumerable advantages associated with spiritualism. You develop open-mindedness and appreciate others’ achievements. You become tolerant, patient, optimist, confident and compassionate. You maintain sound mind in a healthy body. You enjoy every moment of your life. Spiritualism helps forgive others and forget unpleasant past. It helps look at similarities, not differences. It breaks barriers and builds bridges. It connects people and brings them into one platform. It improves health and ensures longevity. It helps overcome challenges with calm and composure. It helps make smart and wise decisions by blending head, heart and gut. It converts you into a better human being. Spiritualism enlightens people. It helps them introspect themselves and empathize with others. It eliminates conflicts and enhances unity and camaraderie. It removes negative thoughts from their mind and replaces with positive thoughts. It enhances their creativity and helps them think differently. It helps them realize and unlock their hidden potential. Above all, it helps them find meaning in their lives to make a difference to the world. The human brain is basically rewired to ensure survival rather than success. We spend most of our time with repetitive thoughts. And most of our thoughts are negative in nature. Research shows that the average person spends 95% of their day going through repeat thoughts. Worse, an average 75% are repeat negative things, just 20% on positive repeat thoughts and only a tiny 5% on new ideas. When you stress on spiritualism you think positively without wasting your time on your unpleasant past events. You emphasize new areas and explore them to achieve an amazing success and happiness. Here are some tips to lead your spiritual life. Be simple and humble. Walk your talk. Be a giver, not a taker. Invest some time regularly to serve others. Associate with positive and likeminded people. Emphasize ideas rather than individuals and issues. Add value to others. The human body undergoes three phases ― creation, generation and destruction. The body is mortal while the soul is immortal. To make our lives immortal, it is advisable to wed spiritualism. When a man marries a woman, he craves for physical unification first, emotional unification second and spiritual unification third. When married couple understands each other well, they reach the third stage successfully. It is possible only when people understand and appreciate spiritualism. Love your mother but don’t hate another person’s mother. As your mother is precious to you, another person’s mother is equally precious to him/her. As your race, religion, region, language, ethnicity, culture, and community are precious to you; they are equally precious to others. People must empathize with others to make a difference in the lives of others. We need empathetic leaders like Mahatma Gandhi, Martin Luther King Jr, Mother Teresa, Nelson Mandela, Mikhail Gorbachev and Dalai Lama; and religious leaders like Jesus, Buddha, Muhammad and Gurunanak to name a few to achieve global peace, prosperity, stability and security. Remember, what Mother Teresa said when asked what you can do to promote world peace: “Go home and love your family.” As charity begins at home, let us promote global peace by loving our families and empathizing with others first. Currently there are several conflicts globally due to religious, racial and regional intolerance. Embracing spiritualism is the only way to bring the improvements in the society. We brought nothing to this world when we were born. We will not carry anything from this world when we die except either good or bad reputation. Hence, stress on spiritualism to spread peace and love in the world. Life is an echo. If you do good things, you get back good things. Hence, do good to others to build a better world. To conclude, spiritualism is the only way to provide meaning to your life and to build a better world. 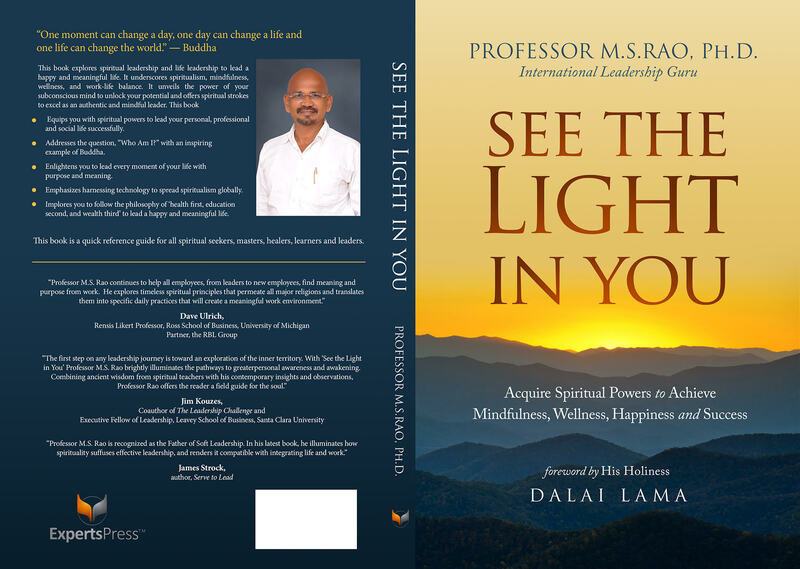 Note: This article has been adapted from “See the Light in You: Acquire Spiritual Powers to Achieve Mindfulness, Wellness, Happiness and Success.” His Holiness Dalai Lama wrote foreword for this book.